Ferdi McDermott, MA (Edin), PGCE, MEd, MCIL, FCollT, FRSA. Ferdi McDermott founded Chavagnes International College in 2002 after several years in publishing and journalism. A modern languages graduate of the University of Edinburgh with his Postgraduate Certificate of Education (PGCE) from the University of Buckingham, he is currently completing a Masters in Education, also from Buckingham. He is a Member of the Chartered Institute of Linguists and Fellow of both the Royal Society of Arts and the College of Teachers. 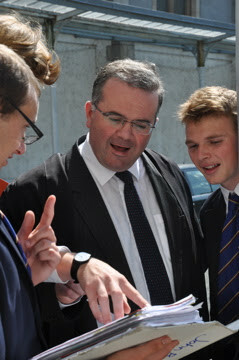 Mr McDermott teaches French, English, Religion and Latin and is Principal of the College. He is a member of the resident community of Fellows of the College, called the Company of St Gregory. He keeps an online blog here. Father Bede Rowe, MA(Oxon), MPhil. Father Bede Rowe is a Theology graduate of the University of Oxford. He also holds an MPhil degree from the University of Bristol where he was formerly on the teaching staff of the Department of Religious Studies. He is a priest of the Diocese of Clifton in the UK. Prior to taking up the post of chaplain at Chavagnes he was parish priest for five years in Warminster and chaplain to the Army. He teaches Religious Education at Chavagnes. He keeps an online blog here. Gareth Usher, BEd, Dip. Ed. Man., MRAeS. Gareth Usher is a graduate in Sports Science from the University of Liverpool and holds a Diploma in Education Management from the University of Ulster. He is a Member of the Royal Aeronautical Society. After five years service with the Royal Airforce and four years with the police force in Hampshire, Mr Usher moved into teaching. Since 1982 he has taught continuously in private and state schools in England and Northern Ireland and was until recently Head of Science and the Private American School of Paphos, Cyprus. A former hockey and rugby international, Mr Usher coaches the senior rugby team. He is also Senior Master with responsibility for staff training and for the academic and disciplinary aspects of the Senior School. He lives nearby the College with his wife and family. Michael Leach holds a Bachelor of Science (Psychology and Sport) degree from the University of Leeds. He is a member of the British Psychological Society. After several years coaching sports and working with disadvantaged children for a leading Children's charity, he moved into teaching in 1997. He has taught English, RS, Psychology, KS3 Spanish and Sport in the UK state sector and prior to coming to Chavagnes was Head of Boy's Sport and a Faculty Co-ordinator for Physical Education, Music, Art and ICT, at a private international school in Marbella, Spain. Mr Leach, is Head of the Junior School and Head of Sport. He teaches Sport, English, Biology and Spanish at Chavagnes, He resides at the school and also teaches the guitar. Sebastian Crawford read history at Cambridge (Peterhouse) and holds a PGCE from the University of Buckingham. He has taught History, Latin, Mathematics, Religion and English at the College since 2009 and is responsible for the Chavagnes Scout Troop. He is also Provost of the resident community of Fellows of the College, called the Company of St Gregory. Charles Tyldesley is a Classics graduate from the University of Exeter. Mr Tyldesley has been teaching Latin, Greek, English and Music in the College since 2011. He also assists Mr Crawford with the College's Scout Troop, coaches soccer and teaches the flute. Mr Tyldesley is assistant Choir Master and a member of the resident community of Fellows of the College, called the Company of St Gregory. David Senosiain holds a teaching Diploma from the Pontifical University of Navarre, Spain. He previously taught at Chavagnes from 2007-2009 and has returned this year as teacher of Spanish. He is a member of the resident community of Fellows of the College, called the Company of St Gregory. Philip Gonzales teaches Philosophy, Classical Civilisation and English. He holds his MA from Ave Maria University and his MPhil from the Pontifical University of Louvain, Belgium and came to Chavagnes in 2010. He is currently pursuing a doctorate in Philosophy and regularly contributes to philosophical conferences and journals. He lives at the College with his wife Sara and two young children. His wife, who also holds a Masters degree from Ave Maria University, assists with pastoral care and with teaching of English as a foreign language. John Hayes graduated from the University of Oxford and continued there for his research degree. He worked for a year in industry before returning to Oxford for his teacher training, then worked for 14 years at the De La Salle College, Jersey. He has also taught in Spain and speaks Spanish and German. He has specialised in Mathematics and Science at Chavagnes since January 2003. Mr Hayes also coaches cricket and Cross Country at the College. Nicholas Lloyd graduated in the Natural Sciences from Trinity College, Cambridge. He was a senior engineer at British Aerospace for several years before moving into teaching. He holds a PGCE from the University of Buckingham and has taught at the College since Easter 2003. Mr Lloyd holds a Licentiate in Piano teaching from the Trinity College of Music. He directs the College Choir and teaches piano. His wife Christine is a veterinary surgeon who works locally. Over the years she has helped at the College with theatrical productions and some teaching, including German. They have four children, two of whom were educated at the College and are now at University. Dr Thomas Conlon holds degrees from Queen's University, Belfast and the University of Bristol. He has taught Mathematics, Physics and Latin at the College since 2003 after a career in the telecommunications industry. After serving as Head Master from 2004-2006, he now continues to teach A-level classes part time. He writes regulary on scientific, historical and literary themes and recently published a book on the history of science: Thinking about Nothing: Otto von Guericke and the Magdeburg Expermients on the Vacuum, available from AMAZON. He is married with three adult sons. Jonathan Battye read Literae Humaniores ('Greats') at Oxford, before completing a postgraduate degree at Durham in Ancient Philosophy. He is a qualified trainer in First Aid and long-serving of member of St John Ambulance. He also enjoys rowing and walking. He is married with three children and lives in the College with his family. He teaches Junior Science and Classics whilst studying for the Buckingham University PGCE (2012-2013 academic year). Didier Chaillou is a 'Professeur certifié' in the French national system, having worked for many years in local state-funded secondary schools as a teacher of French. André van Lindhout holds a Master degree in Social Sciences and is a qualified teacher of History in the Belgian system. He is a fully qualified Maître d'Armes and teaches fencing at the College one afternoon per week. Colonel Jean-François Leroux is a qualified sport teacher in the French national system. He was formerly a cavalry colonel in the French Army and then Equerry at France's élite national riding school, le Cadre Noir, in Saumur. He teaches riding to boys at the College every afternoon. He and his wife live in Chavagnes. Mrs April Boyles is a graduate in Art and Design. She teaches Art to the boys at the College every Wednesday and helps with theatrical productions; her husband Denis Boyles is a professional writer who cooperates with the College on various projects. Mrs Joan McDermott is a retired teacher resident at the College. She holds a Certificate of Education from the University of Southampton (LSU). She assists with the pastoral care of boys and often helps with additional tutoring in English or Mathematics. She was a founding member of the College in 2002. The College complies with French employment legislation and the "Convention Collective de l'Enseignement Privé Hors Contrat". The College is an institutional member of the College of Teachers (London), the world's oldest professional body in education. We abide by their Code of Practice.